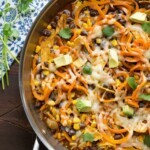 This spiralized sweet potato enchilada skillet contains spiralized sweet potatoes, corn, black beans, and enchilada ingredients. It is an enchilada shortcut that gets dinner on your table in 30 minutes! Well, this certainly wasn’t planned, but why don’t we call this week the week of ‘Denise trying out food trends’. Because Tuesday, I found out just how amazing Black Bean Brownies are, and now here I am today, discovering the wonders of my new spiralizer. And I will be the first person to tell you that I am still not so sure about this veggie noodles thing. Because I’m almost 6 feet tall and I need a solid meal to really fill me up, I’m 99.999% sure that my body is going to know that the noodle it just ate was zucchini. But I really do love the idea of adding new textures to a dish and so I decided to get myself a fancy spiralizer. And I am definitely a fan of it! OBVIOUSLY the first thing I wanted to spiralize was a sweet potato…because clearly I am a sweet potato crazy person. Spiralizing the sweet potato was a bit tricky at first, but once I got the hang of it, it was SUPER easy. Next you add the corn, black beans, tortilla strips and enchilada sauce. If you are from Canada then you feel my pain. Enchilada sauce is a HUGE PAIN to find here! So instead of trying to hunt it down, I used Ali from Gimme Some Oven’s recipe for enchilada sauce. I leave out the salt, and make sure that the final volume is 2 cups, because if it over-reduces, it is overpowering in this recipe. OK. Then you add the cheese. Obviously the most important part of the recipe. I put the skillet in the oven for a few minutes until the cheese melted through and the enchilada sauce got nice and bubbly, then gobbled it up. Seriously. SO good. 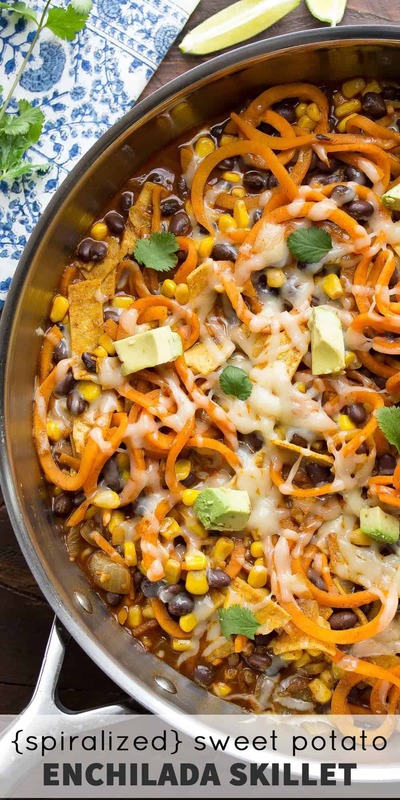 I honestly wonder if I will make bona fide enchiladas again, because this spiralized sweet potato enchilada skillet was darn good, and about 10 times faster. It’s absolutely perfect for a weeknight dinner! 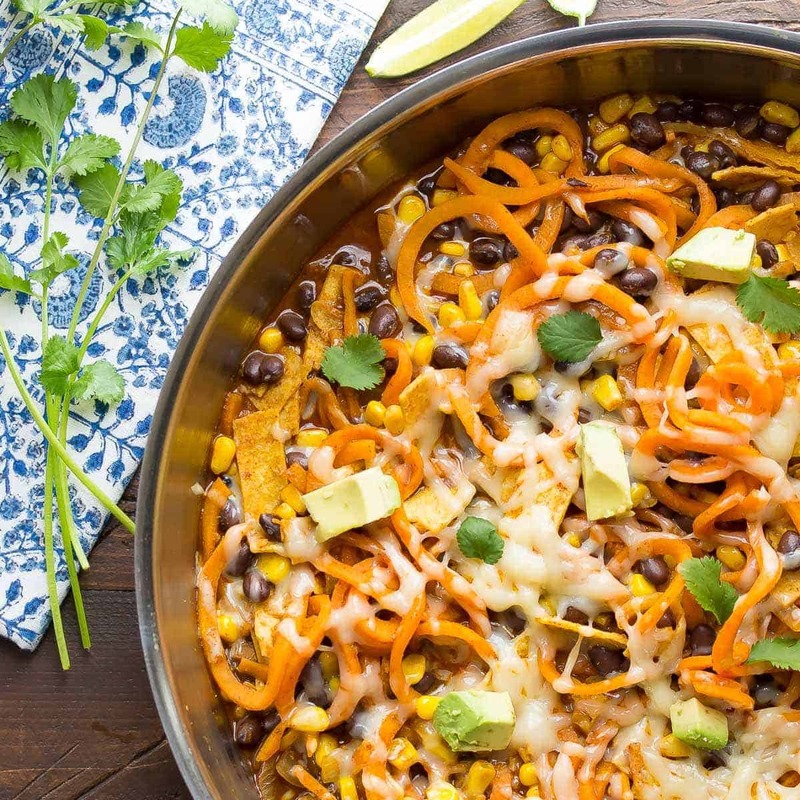 I love how gooey the tortillas get in this skillet, and the flavor that the sweet potato noodles bring to it. Definitely a new favorite dinner recipe around these parts! So in the case of spiralizers, are you a yay or a nay? So far, I’m a big YAY! or how about some Spiralized Pasta with Egg and Asparagus? In a large, ovenproof skillet (12 inches) heat the olive oil over medium heat. Add the onion and cook for 5 or so minutes, until translucent and soft. Add the sweet potato noodles, and cook for 10 or so minutes, until al dente. They should have a bite to them and not be completely soft. Add the black beans, corn, tortillas, enchilada sauce and half of the cheese. Stir until completely combined. Sprinkle with the remaining cheese and place in the oven for 5 or so minutes, until cheese is melted and the enchilada sauce bubbles. Serve with optional toppings listed. * I used this recipe for the enchilada sauce, omitting the salt and bringing it back up to a volume of 2 cups. What kind of spiralizer do you use? I’ve been using a little hand held one and I’m not totally satisfied with it. This is the one I have! https://amzn.to/2DnpphB I have also heard great things about the Inspiralizer, but haven’t tried it myself. This was absolutely amazing! I cheated a little and had a bag of frozen green giant spiralized butternut squash and thought that might be close enough? It was wonderful! This will be a weekly meal for me! I’m excited for my daughters to try it too! I added a little cayenne and cumin and crushed a few tortilla chips as someone else suggested too and that was great! Thank you for the great recipe! Oh and I also spiralizer some red, yellow, and orange peppers and that was delicious! I made this tonight and it’s one of my favorite vegetarian dishes to date and so fast/easy, perfect for mid week dinner! Thank you! Hi Chandra! What an awesome comment…thank you so much and I’m glad you like it so much! I just found your recipe and made it tonight. Thank you for sharing, it was a hit. I did add some ground turkey to the onions as they were cooking as well as about a teaspoon of cumin. Hubby enjoyed it. I will be making this again. Hey Denise, how long would these last in the fridge? Could this recipe be used for meal prep? Hi Alex! I haven’t tried this myself, but a reader used this as a meal prep recipe and enjoyed it. I would definitely cook the sweet potato noodles al dente, and I think it would keep for 4 days 🙂 Let me know how it goes if you try it! SO GOOD! I got this recipe bookmarked and have made it again and again. Sometimes, I add crushed up tortilla chips on top for a little extra crunch. And tonight, I’ve made some pickled onions to toss on top, because– why not? I’m definitely a fan of this healthy, flavorful recipe. ? So happy you like it Chris! 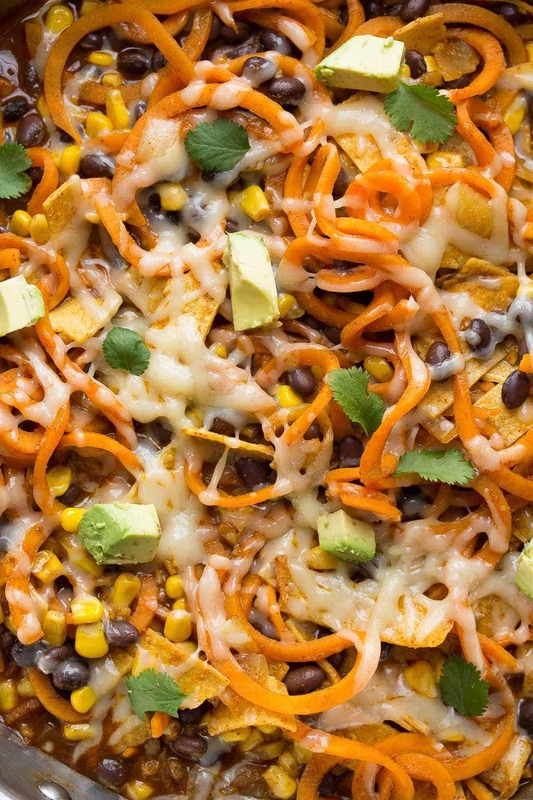 Definitely trying tortilla chips on mine next time…and pickled onions too! I want to try this with a fried or poached egg on top! The one time I tried to spiralize sweet potato, it was very hard, but I’ll try again. 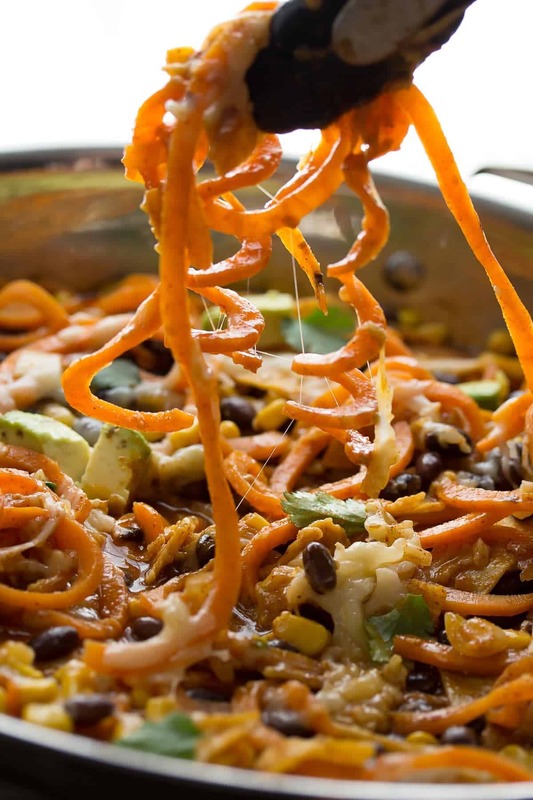 I’ve never made sweet potato noodles before (nor have I used my spiralizer for anything yet). Roughly how many sweet potatoes are needed for this recipe? Hi Laura! I believe it was one large sweet potato. Try to find a fatter, relatively straight sweet potato if you can, as it’s more challenging to sprialize the skinny/twisty ones. I hope this helps, and hope you enjoy the recipe! Hi Courtney! Hmm…you could replace the sweet potatoes with some bell peppers, maybe? Or even some zucchini noodles might be nice in here. Let me know how it goes! Thanks for your tips, Bonnie! Glad you guys liked it! OMG! This is way better than I even expected! Thankyouthankyouthankyou!!! Are these nutritional facts per serving or for the entire dish? Hi M! It’s for one serving (if you divide the whole pan into 6 servings). I used the MyFitnessPal app, so they may not be 100% accurate. I hope this helps! Holy moley!! This recipe is stupid good. I just can’t get over how such simple, everyday ingredients turn into this deliciousness. Seriously!! My 20 year old son actually requested that I make it (again) two nights running. Now that is saying something from his little carnivore self. I used a bit of cheddar instead of the mozzarella, and skipped the yogurt, and one can each of red and green enchilada sauce. This was just total deliciousness!! Huge apology for not replying sooner, Brandi! I’m really not sure how this would freeze, and I’m worried it would get really mushy. According to this site, you can freeze raw spiralized sweet potato, and it wilts when you thaw it. So if you do go the route of freezing, you may not want to cook the sweet potato through? Let me know if you try it! Delicious and so fun! My kiddos will go crazy over the spirals and I’ll go crazy over the taste. Seriously, I’m drooling over here. I am a super sweet potato person too! And I’m also a huge enchilada person, so this is perfect! And, I just got a spiralizer for Christmas and have been looking for more recipes to make with it! This looks delicious, Denise!! I love this Denise! I’ve had a spiralizer for a few months and I just can’t get enough. This skillet meal looks incredible with all those flavors! It’s so fun, isn’t it? Thanks, Alyssa! I still have yet to buy a spiralizer! I keep thinking about it but I really don’t want another kitchen gadget!! haha But I do love the idea of it! Anyway, this skillet sounds soooo good. 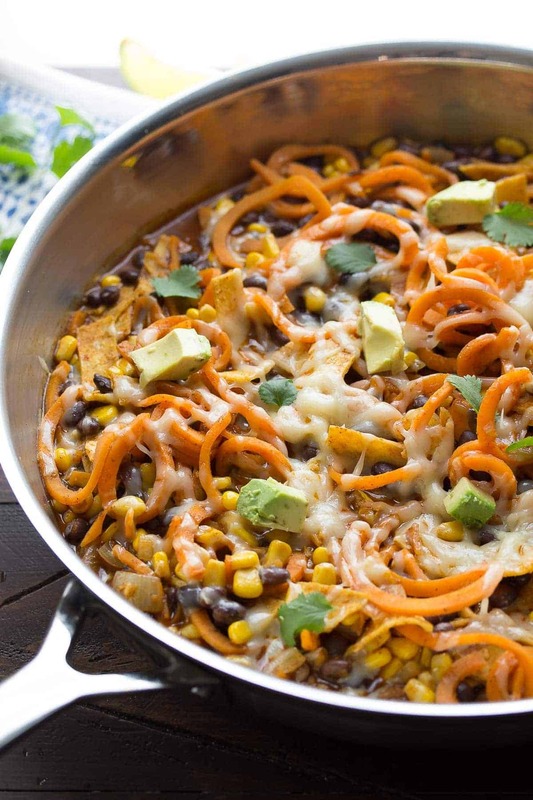 I am obsessed with anything sweet potato and enchilada … so combined?? Awesome. I know, I held off for a long time, but I finally caved and I’m so glad I did 🙂 Thanks, Ashley! Oh, big swoons happening over here! 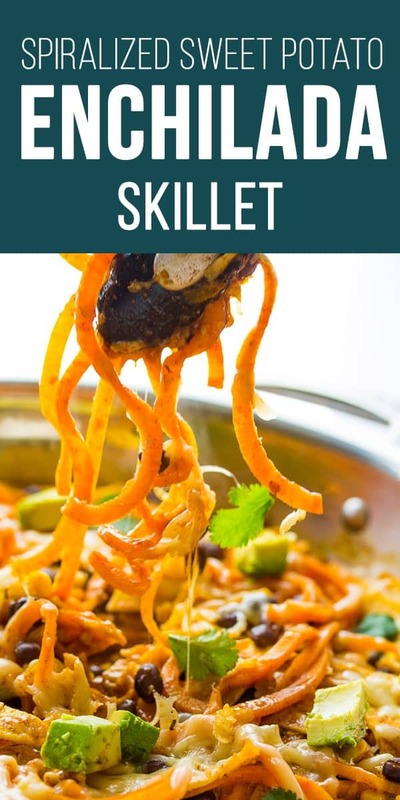 I just have a little spiralizer and I don’t know how it would do with a sweet potato, but this seriously sounds so good I’ve got to try it. And it’s so pretty!! Thanks so much, Rachel! I’m not familiar with the small spiralizers, but I’ve read that you can just use a vegetable peeler to get a similar effect? Not that I’ve tried it, though. I can’t get enough of spiralized noodles and this meal looks perfect. I love skillet meals and love the combination of flavors here. I wish I had a big plate of this for dinner! I am definitely on the veggie noodle bandwagon, now! Thanks so much, Ashley! I LOVE my spiralizer, and like veggie noodles more than pasta (which I wasn’t sure was even possible!). I’m a crazy sweet potato person too so I’m crazy about this, Denise! This looks all kinds of delicious and I cannot wait to make it! I haven’t tried veggie noodles as a pasta substitute yet, but I am going to try to mix them in to start. I am so excited about this silly gadget! Thanks, Marcie! Thanks, April! I really LOVE the textures it ads to salads etc.